Allow your honeymoon to exceed your expectations with this incredible selection of hotels which allow you to relax, explore and daydream. Our planet is immense and full of unique opportunities. To celebrate your honeymoon, you have to ensure that you’re in the best surroundings which offer a multitude of activities, but also of vital importance are the hotels and services which must satisfy all of your requests. Here at Zankyou, we have compiled the very best hotels for your honeymoon in the whole world, located in countries expanding far and wide. Why would you settle for anything less than the best? 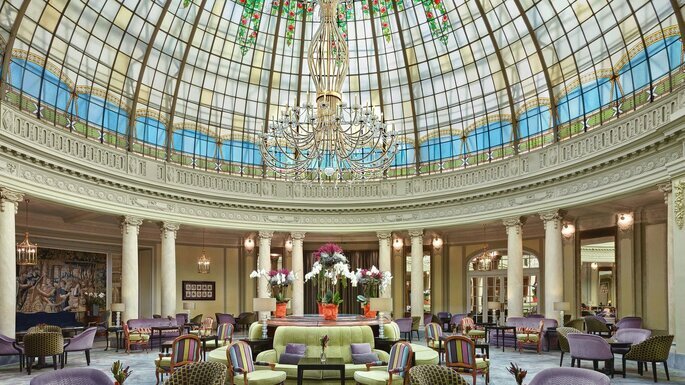 This hotel’s renovation in 2009 has catapulted it all the way to the top of our list. It is located within the Mara river, which runs around three sides of the hotel and brings a touch of freshness to counteract the African heat. What a perfect mix. The rest of the hotel exudes originality, mainly due to its 50 luxurious tents which boast incredible views of crocodiles and hippopotamuses as they splash around in the water. It is, without a doubt, a pleasure to spend the night in this beautiful part of the world which offers you endless possibilities for adventure, including their speciality safaris. One of their safaris even takes place in a hot-air balloon! You can experience the two extremes here: on the one hand they offer relaxing experiences such as an exquisite breakfast in bed and on the other hand they offer those that provide a true adrenaline rush, such as a visit to the marvellous Maasai Mara reserve. A visit to this fabulous reserve will give you the unique opportunity to see the so-called Big Five (leopards, lions, elephants, buffalos and rhinos), as well as zebras and cheetahs. An opportunity not to be missed! 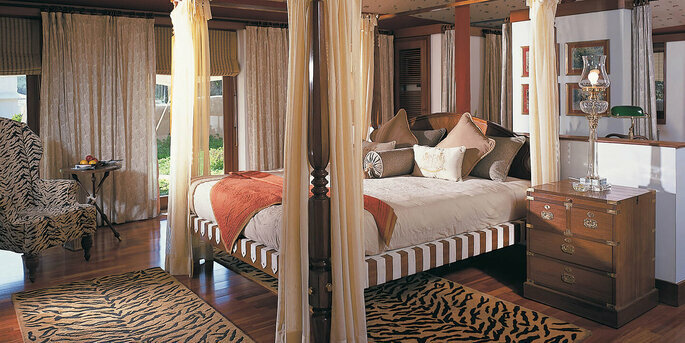 Luxury is at the forefront of this stunning resort, both inside and outside, which has been a true triumph in India. Inside, the exquisite traditional details and atmosphere adorn every centimetre and on the other side of its walls, nature extends in its wildest form. One of the animal kingdom’s greatest treasures, the Bengal tiger, can be found here in the Ranthambhore Tiger Reserve. Among the hotel’s incredible services is the delicatessen which the restaurant offers, specializing in cooking from Rajasthan. The Oberoi Spa at Ranthambhore also stands out, a luxurious relaxation sanctuary which bases its treatments on Ayurveda, a traditional Indian medicine. In Nevis, one of the Caribbean islands which belongs to the Federation of Saint Kitts and Nevis and where paradise comes to life, this hotel homes the only remaining historic plantation inn on the beach in the Caribbean. In fact, its relationship with nature becomes even closer when we consider the main building, which was constructed in 1778 amongst an army of breathtakingly beautiful palm trees. The fabulous resort extends over more than 100,000 metres squared where you can find 36 beautiful lodges with a typical Caribbean aesthetic and top-class service. After you’ve been treated like a VIP in your stunning accomodation, it’s up to you to decide if you want to watch the world go by from the comfort of a hammock next to the turquoise waters of the Caribbean sea, or if you would prefer to explore the island and be adventurous. The staff at this hotel certainly know exactly how to treat two newlyweds. 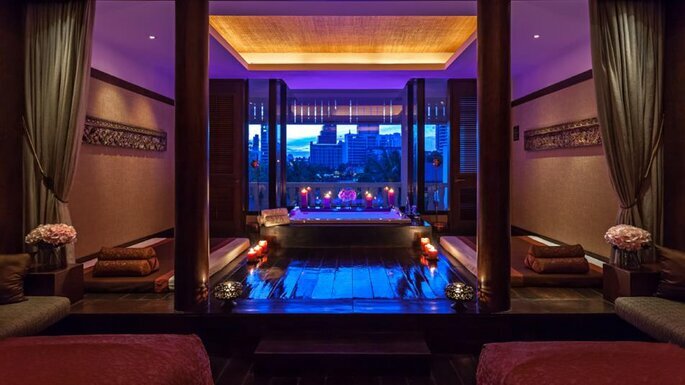 They do it from their ‘urban oasis’, a term which perfectly describes this lavish hotel which sits within the hustle and bustle of the Thai capital, whilst retaining the complete tranquility of a tropical retreat. 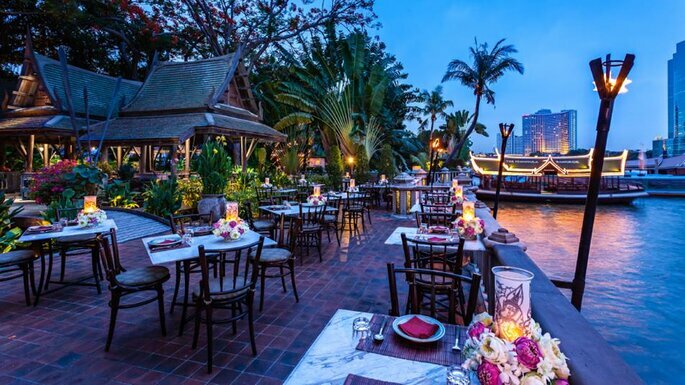 In fact, its position on the Chao Phraya, known as the River of Kings, ensures this peaceful bliss. The whole hotel is characterized by the most authentic Thai charm, from its rooms to the exquisite cuisine which is prepared in the kitchens. Somehow, they have managed to blend the power of tradition with the glamour and innovation of the modern day. Furthermore, the hotel has been named as one of the oldest Asian companies on the continent, meaning that they have all of the necessary experience to make your stay perfect. 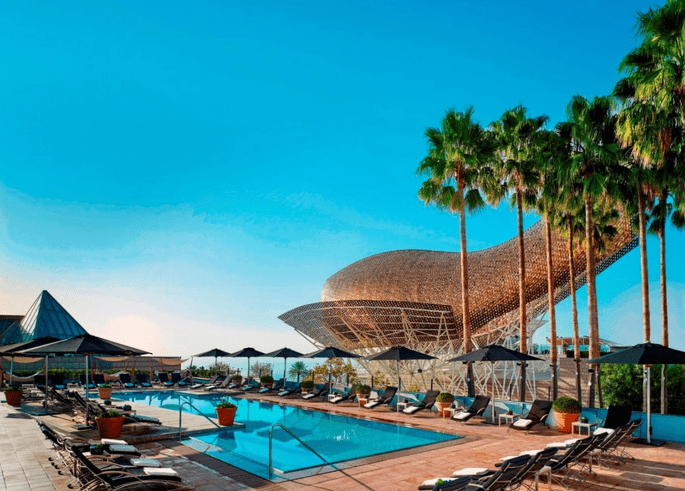 The most eye-catching aspect of this hotel is its shape: with the same design as a ship’s sail, its structure rises up to the sky an leaves a beautiful and powerful stamp on the coastline. The hotel’s architecture is a symbol of modernity and of the trend-setting tendency which characterizes Dubai. 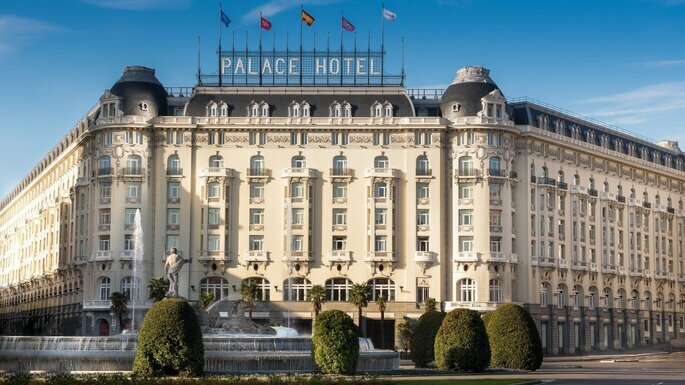 This hotel is perfect for demanding visitors, since it has been voted the most luxurious hotel in the world several times. It’s also perfect for honeymoons due to the multitude of activities on offer, such as helicopter rides, private beaches, driving a Rolls Royce or access to one of the best restaurants in the world, the Nathan Outlaw at Al Mahara. Bali… The word paradise doesn’t suffice when it comes to describing this precious place, which is capable of leaving even the most sceptical person breathless. Although Bali has grown in popularity among tourists in recent years, there is still so much more to be discovered in this stunning tropical sanctuary. 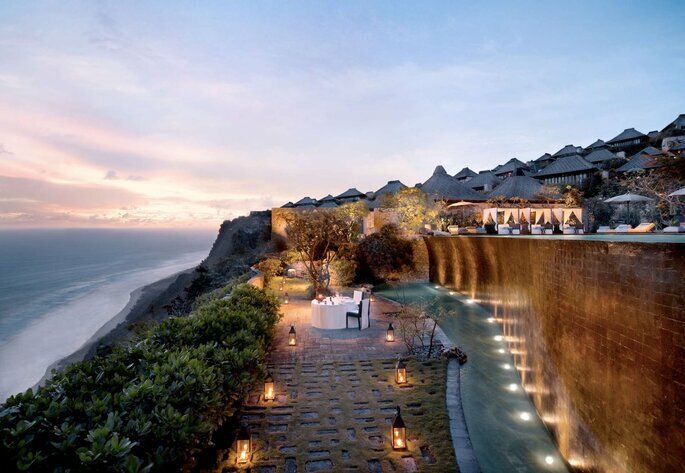 For this reason, the staff at the Bulgari Hotel Bali have maintained the excellence of Balinese design and combined it with the most sophisticated Italian style. The result? An incredible location which has everything that a couple could want on their honeymoon. 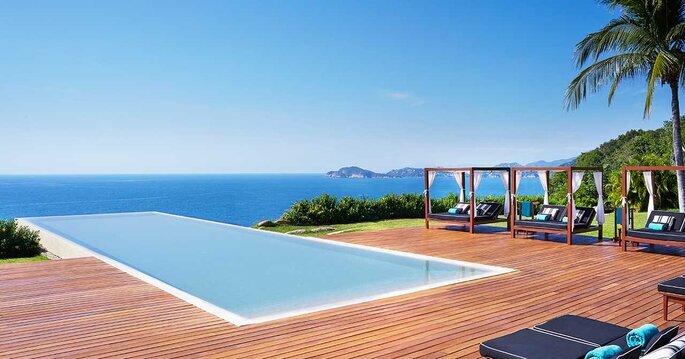 Enjoy the three types of accomodation: Ocean View Villa, The Bulgari Villa and The Five-Bedroom Mansions. Some of them are accompanied by private pools and extraordinary views of the Indian Ocean and to top it off, there are endless amazing activities for you to participate in, such as flying over one of the country’s volcanoes in a helicopter or discovering every corner of the surrouding islands. Pure luxury. This mythic hotel is a gem of Spanish culture, immersed within the city’s intellectual hub. Situated in the Literary Quarter, the hotel combines its cultural side (it is very close to the Prado Museum, the Reina Sofía and the Thyssen-Bornemisza Museum) with the luxury of its bedrooms, lounges and services. Indeed, all of these spaces are characterized by the most majestic decorations in the whole city which have being creating a reputation for the hotel since it was built in 1912, but which have also been revived and adapted to suit the 21st century. It also combines some of the finest restaurants such as La Rotonda, with exotic flavours like the Asia Gallery or the Green T Sishi Bar. In both cases, tradition and innovation come together to create unforgettable dishes. Facing the sea, the Copacabana Palace can be found in one of the world’s most vibrant cities, where colour and light unite to create marvellous fiestas. In fact, the beach which accompanies the hotel holds the Carnival and New Year’s Eve celebrations, the two most important Brazilian events. However, the luxury and vibrancy lie not only within the city itself, but also within this hotel, which is its true gem. Built and decorated in line with Art Deco style, the hotel includes rooms with perfectly conserved 20th century designs, as well as incorporating all of the elegance of the greatest artists and celebrities of the past and present, such as Marlene Dietrich and Orson Welles who visited the hotel in its early years. The seven Penthouse Suites particularly stand out, with all of the luxury that you could imagine from enormous terraces with mind-blowing views, to private pools and butler service. What’s more, there are top-class gourmet restaurants which specialize in Brazilian, Asian and Italian cuisine. This hotel is one of Barcelona’s reference points due to its excellent location and the luxury of its shape and surroundings. Its design is very characteristic, made from glass and featuring 44 meticulously constructed floors. In fact, it was actually created for the Olympic Games in 1992, a key moment for the city and for Spain which iniciated a step towards sophistication and modernity. The Hotel Arts in Barcelona is a fine example of this. 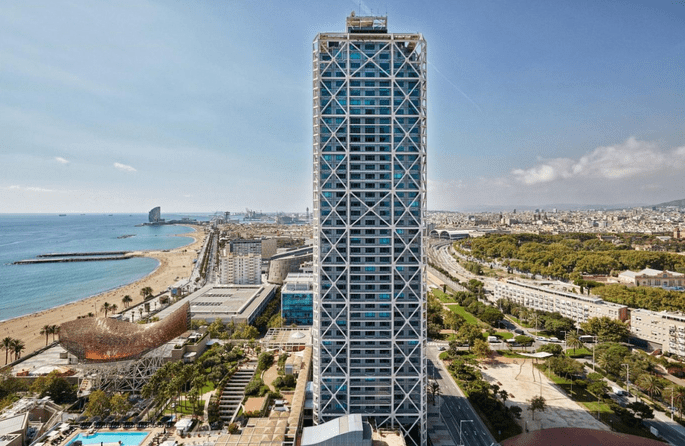 Situated in the Olympic Port, it’s just a few steps away from the Mediterranean and Barcelona’s old town, a precious gem of European gothic architecture. But the interior certainly does not disappoint: the Penthouses provide a luxury stay where you can sleep amongst the moon and the stars on the top floor of the hotel; 43 the Spa sits on the penultimate floor, which is the ultimate relaxation spot with views of the Mediterranean horizon; and the restaurants, which showcase the city’s excellent gastronomy and provide a treat for the senses. Special, magical, unique… This is the Banyan Tree Cabo Marqués, one of those places which is designed for man, but built to reach a whole new level. Constructed on one of the beautiful cliffs which make up the most natural part of Acapulco, the hotel looks over the Pacific and boasts the best sunsets that you could ever imagine. 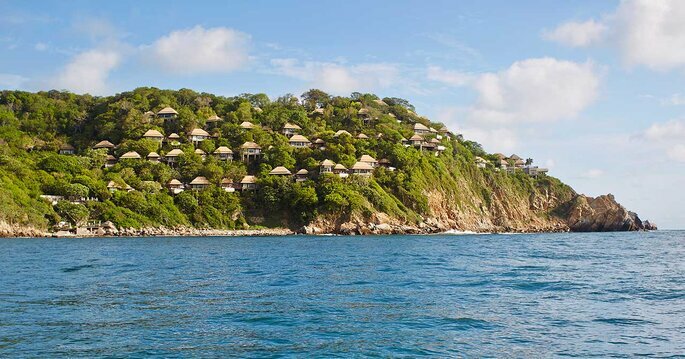 Acapulco, despite being a popular area for tourism, maintains areas of tranquility like this hotel, making it perfect for newlyweds who want to disconnect from everyday life and connect with nature. 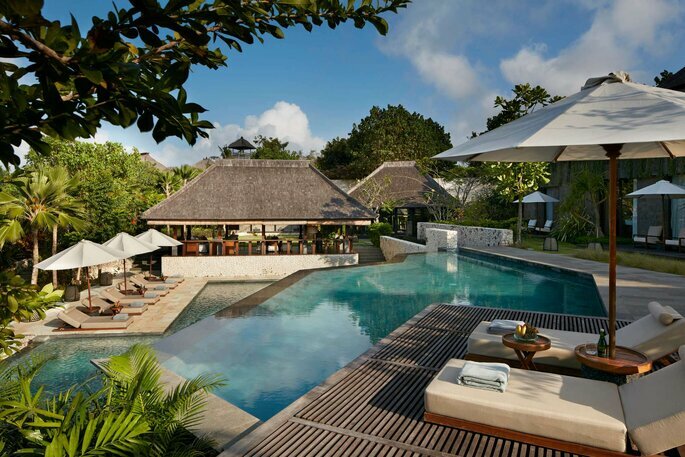 The villas are the biggest attraction for those who want to feel as if they’re in a private oasis. With stunning bedrooms, private pools and terraces as well as the view of the ocean, the visual aspect is equally as comforting as the luxury accomodation. These villas are also the perfect place to sample the gastronomic delights in the privacy of your own room, from breakfasts to dinners, as well as endless romantic activities to consolidate this intimate moment. There you have it! The world’s best hotels for your honeymoon according to our readers and our team. Without a doubt, you will be able to have the honeymoon of your dreams in any one of these hotels and luckily, they are found in some of the most breathtaking locations on the planet.